Published on Monday, June 18, 2012. Update: Check out the video recap of our Give & Take Library Salon Series event above. Over the last week we've introduced you to Mike Haeg and Katie Hargrave, two marvelous Minnesota artists who will be presenting at 7 p.m. this Thursday as part of the ACC Library Salon Series, featuring a Give & Take event co-presented by Works Progress. Today we present Rebecca Yaker, the final artist to take part in this special edition of our Five Questions series. Rebecca, who began sewing at the tender age of 5, operates out of her Minneapolis-based design studio. In 2005, she launched Hazel and Melvin's Room, and for five years she created one-of-a-kind baby bedding and apparel for clients worldwide. In addition to her sewing skills, Rebecca is an accomplished hand- and machine-knitter. Some of you may know her from her large scale sock monkey pieces, such as the sock monkey prom dress. 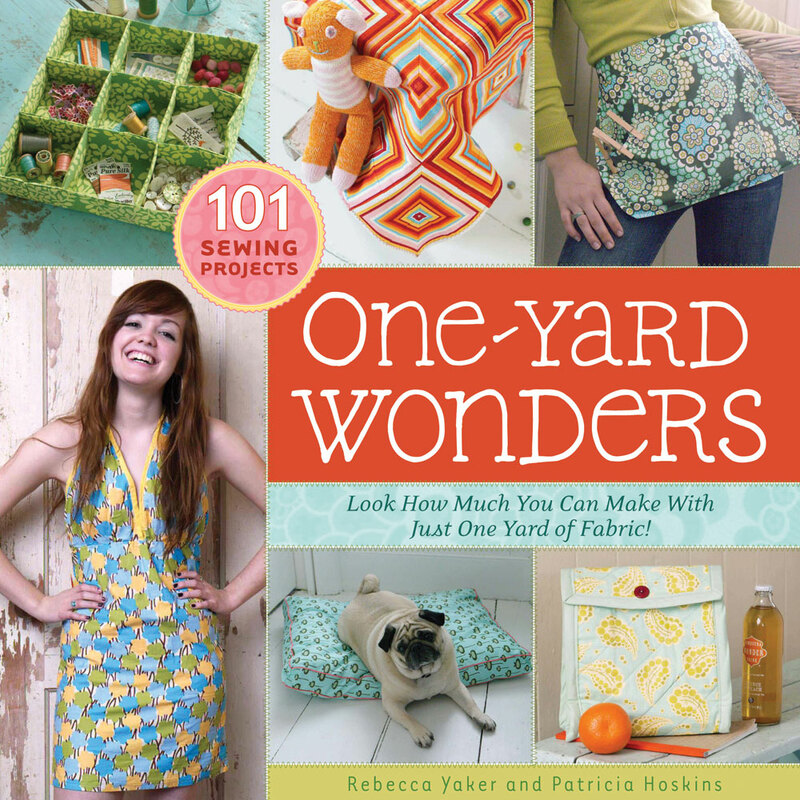 She is the coauthor of the best-selling sewing book series, One-Yard Wonders, with more than 200,000 copies in print worldwide. More than anything, Rebecca enjoys spending time with her husband and their cute-as-a-barrel-full-of-kittens son. I love to make things, and my favorite thing to make has always been clothing. I started sewing at a very young age and have never stopped. 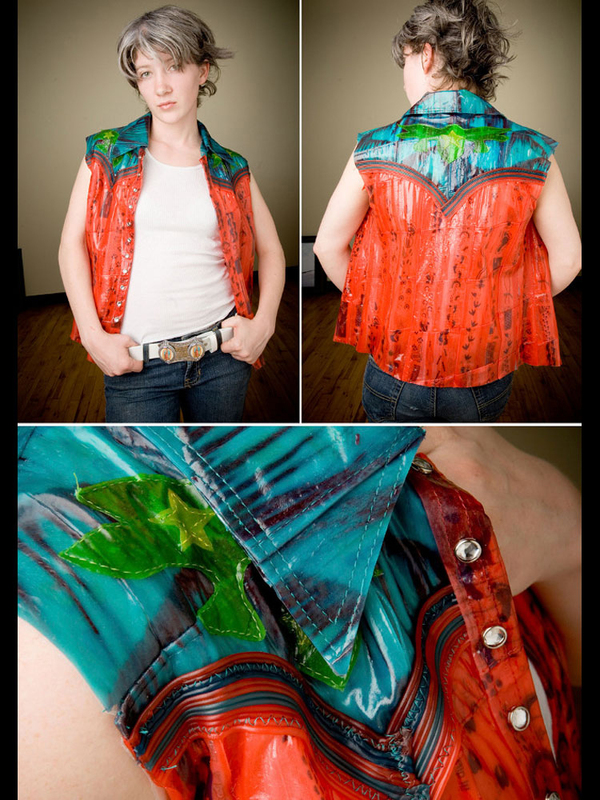 Over the years, I have added other - what I consider to be - apparel making disciplines to my repertoire. Weaving, hand knitting, and machine knitting. I have cut and sewn my woven pieces, as well as my knit pieces. When I have the recreational time, I'm often knitting a sweater for myself or my son, or matching hats for our family. Projects I currently have underway are a quilt, a reupholstered child-sized wing backed chair, two machine knit sweaters, and a few summer dresses, to name a few. And writing sewing books. I have a couple of those under my belt and others in progress. I want more time TO make! I would love to devote a chunk of time to developing and creating original, complicated knit patterns and motifs. Specifically, I want to create a series of graphic, pictorial machine-knitted sweaters through which I would reinterpret images and language into knitting. These sweaters would allow me to present a narrative of my new life as a mother and represent a framework for my journey through motherhood. On a much smaller scale, I'd love to finish my bounty of unfinished projects, such as those I mentioned above. My all time favorite books are vintage instructional knitting and sewing books. I can spend hours pouring over such books from the 1940s to the 1970s. One of my favorite art books is By Hand by Shu Hung and Joseph Magliaro. The book presents the work of 32 fiber related artists. I always enjoy the work of others created by sewing machine or knitting needles. I appreciate the time and details that go into these works. One of my other favorite books is Cosy by the UK machine-knitter Freddie Robins. 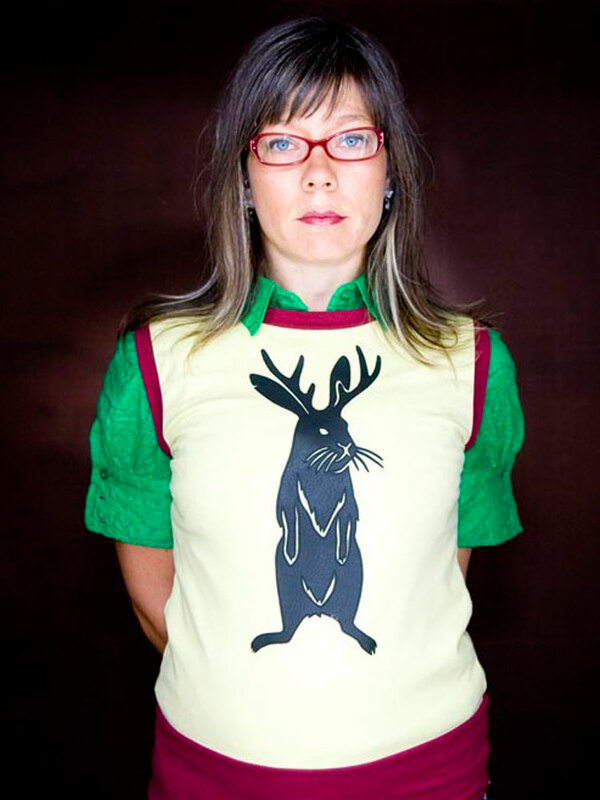 She has an incredibly imaginative and humorous approach to knitting that I find inspirational. I am tuned in to colors, details, and whimsy. I am very taken with color and color combinations in everyday life: inanimate objects, living things, and our environment. I pay close attention to obvious details, but even more to those that are hidden and awaiting discovery. I find that they often speak to the care and consideration that goes into a piece. Through these details, the maker is evoking a bit of themselves in an object. In particular, I am attracted to hidden details that are lively and unexpected. I pay very close attention to things that make me happy, especially those that evoke laughter. I always appreciate the fine handwork and craftsmanship in traditional fiber crafts. I love trying to gain an understanding of how something is made. I would love to hear more about the amazing art of shoe making from the local duo Luisa Fernanda Garcia-Gomez and Crystal Quinn who together are Ina Grau. Seriously, shoes. Amazing. That is something I would love to make, or at least gain an understanding of how to make shoes. A special edition of Five Questions with the innovative maker and mayor of Mt. Holly, Minnesota, Mike Haeg. A special edition of Five Questions featuring artist Katie Hargrave, who will be speaking at our upcoming ACC Library Salon Series.